Be aware, you have a 7th character slot going unused at the moment. No worries. I found out during one of these a while back that odd numbered teams work best to preserve drama. That way you can have the team members trade wins and have the final odd member the tie-breaking final win. So far we got Cape City Birds of Prey vs.The Non-Comics Injustice League vs. Ares' Pantheon Pack(Unfinished) vs. The Arrow-Rogues....This is gonna be wild! Are we allowed to "Call Out" teams for this? I'm not sure what you mean by "Call Out". I'm going to let the players decide how we handle the match ups. We can either do it tournament style, where everyone pairs off against someone in brackets, you write a story against your opponents team, and the better story moves up to the next bracket, until we have a winner. Alternatively, everyone could simply get their own thread and write out a chapter against the opponents team of their choice, and the winners will be determined by the final product. The former would require less writing and be more definitive, while the latter would be longer and require more work, but allow for more creative freedom and allow everyone to tell the stories they want. Also, I'm not completely sure how serious Ken is about his team, whether he's just using them as an example of "how obscure I can go", or if he legitimately wants to use them in the tournament. If we get enough people to qualify for a full tournament, we'll put it to a vote. Welcome to the boards, Shadowmask. And a nice team, one with a central theme, mostly heroes and 90% people I actually recognize. Plus, Nuclear Man is being added to the comics. You technically would be able to still use that list, you'd just need to provide a lot of the info yourself. I'm going to post up a template for character write-ups on here in a bit, and if you can provide all of the info yourself, it'd be fine. This is an example of how I plan on writing up each of my own characters when I post them up later. There will be a follow up post with the template that you can quote as use if you wish. I think this would generally be enough info to allow a person to write a character for this tournament. Appearance: Captain Marvel appears as a tall (roughly 6’4”), muscular man in his early 30s with wavy black hair, handsome features and a prominent chin. His eyes tend to squint and he is almost always smiling broadly. He wears a predominantly red costume with a military-style jacket flap, highlighted with yellow trim, as well as yellow boots, armbands and a yellow belt. On his chest is a broad lightning bolt symbol. He also wears a short white cape trimmed with gold that tends to be draped over one shoulder. Image 1. Image 2. Billy Batson appears to be anywhere from a child of twelve to a teenager in his later teens, generally on the shorter side, but in good shape. He has an unruly mop of black hair and like the Captain, is frequently smiling. Image 1. 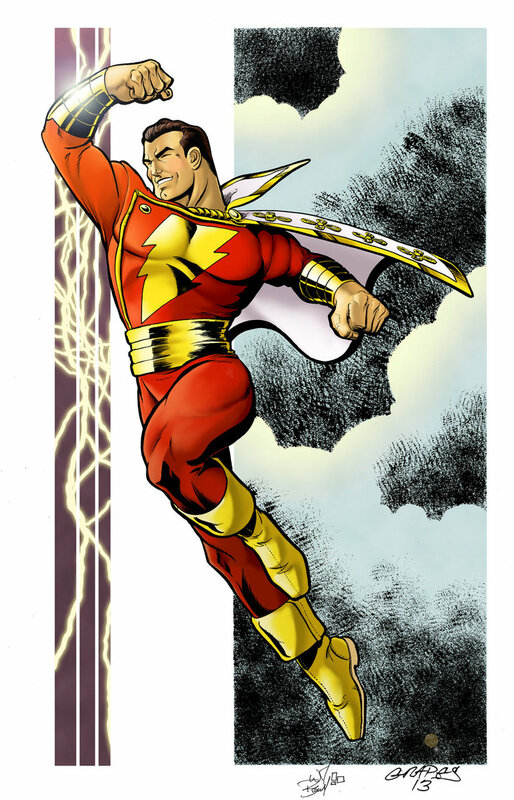 Abilities: Captain Marvel possesses the Power of Shazam, which grants him the powers of several heroes and gods of mythology. • The Wisdom of Solomon gives him a wealth of information and advice, as well as detecting magic and translating languages for him. • The Strength of Hercules and Stamina of Atlas gives him strength, durability and stamina rivaling Superman or the Hulk. The Stamina of Atlas also allows him to survive without food or air. • The Power of Zeus allows him boost or improve his other abilities temporarily, though the larger the boost, the more it drains him. For instance, Cap can use the Power of Zeus to increase the power of his punches, amp the Stamina of Atlas to resist being transformed or improve the Wisdom of Solomon so that he can see through illusions. • The Courage of Achilles makes Cap immune to fear effects and grants him considerable fighting and tactical knowledge. • The Speed of Mercury allows him to move and fly at superhuman speeds. • The Power of Shazam makes Cap highly resistant to magical effects as well as provides him a kind of badge of authority that is recognized in the supernatural community. It also offers numerous small benefits, such as being able to communicate with others in the vacuum of space. • The Shazam lightning that the Captain uses to transform can be used as an offensive weapon if timed properly, though using it always carries some risk. One mis-timed action can result in either catastrophic damage, or the Captain being turned back into Billy Batson. • The Rock of Eternity allows the Captain to travel to any point in time and space, including other dimensions, alternate realities or points in history. Backstory: Overnight, young Billy Batson lost his entire world. His parents were murdered by criminals, his twin sister was lost in the confusion, and the relative meant to care for him instead stole his inheritance and left Billy homeless on the streets. But instead of succumbing to despair, Billy held on to hope, refusing to use these bad circumstances as an excuse to become a worse person. For several years he not only survived, but thrived, and it was this unshakable spirit that caused the young boy to be selected by the ancient the ancient wizard Shazam, to inherit carry on the elder mage’s life long battle against evil. Now, whenever Billy speaks the Wizard’s name, he is transformed by a bolt of magic lightning into Captain Marvel, the World’s Mightiest Mortal. 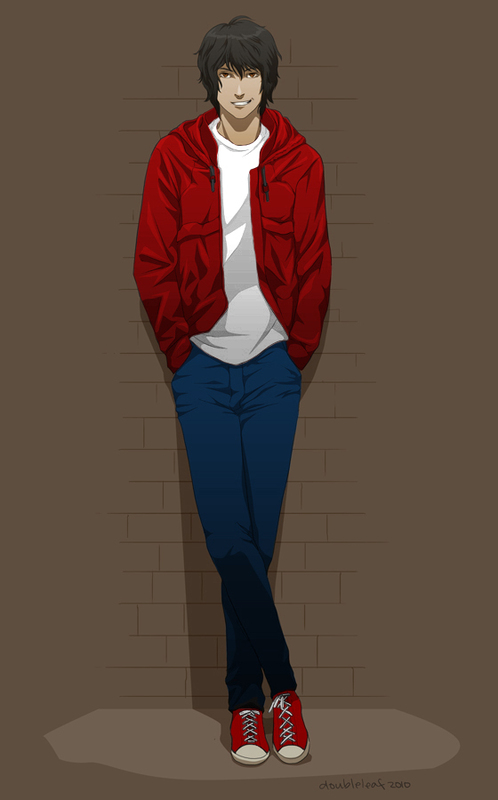 Personality: Billy Batson is a kind, generous and genuinely empathic young man with an incorruptible spirit. He makes friends easily, is genuinely humble about his achievements, has an easy smile and sense of humor, and sincerely wants to help everyone. He has an inquisitive nature that can get him into trouble, but his courage and cleverness frequently get him out of it. He views the world with a genuine sense of wonder, though the tragedies he’s suffered prevent any type of naivety. Above all else, he believes in the power of hope and the ability of the human spirit to overcome its worse nature. As Captain Marvel, Billy is able to more freely act on his heroic impulses, and that freedom often results in him cracking a lot of corny “dad jokes”. However, his greatest gift is his ability to befriend others, and in doing so, inspire a sense of relief and hope whenever he arrives to help. Weight Class: Where you figure the character ranks in the Power Rankings listed on page one. Full Name: Characters full name and whether their identity is secret or not. Appearance: Write up of description, can include image links. Abilities: List of character attributes, skills, powers, equipment and the like. Backstory: Character origin and history. Now this i can work with! Do we put our characters up here or elsewhere Ares? 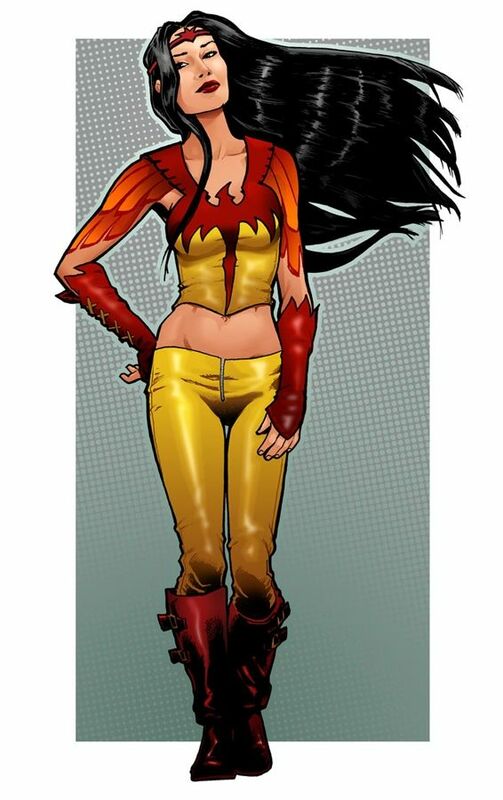 Full Name: Bonita Juarez though her identity as Firebird is secret. • By using her powers to ignite the air around her, she can surround herself with an aura of flames that often takes the shape of a bird, and if she focuses her flames downwards in a tight stream, she can propel herself through the air like a rocket. • She can channel her powers through her hands to seemingly project searing thermal blasts from her body (actually from her mind), capable of melting steel. • She can fly by riding wind currents stirred up by the nimbus of fire with which she surrounds herself while flying. Although she can propel herself at superhuman speeds, she cannot breathe at those speeds without skin protection and an oxygen supply. Fatigue impairs her performance after approximately one hour of peak expenditure of power. • She has also displayed a limited power of precognition, allowing her to have glimpses of the future. Personality: Originally Bonita was a somewhat naive girl possessed of amazing powers that she did not understand. Recently she gained a tougher streak during combat though this did not dampen her religious beliefs or her generally pleasant nature. * - From an alternate Earth (Earth 308). We don't have a full crew yet, and the turn in time will likely be lengthy, so don't feel stressed about time. Be good to have another alumni doing this.